Just ME: Jump for joy! 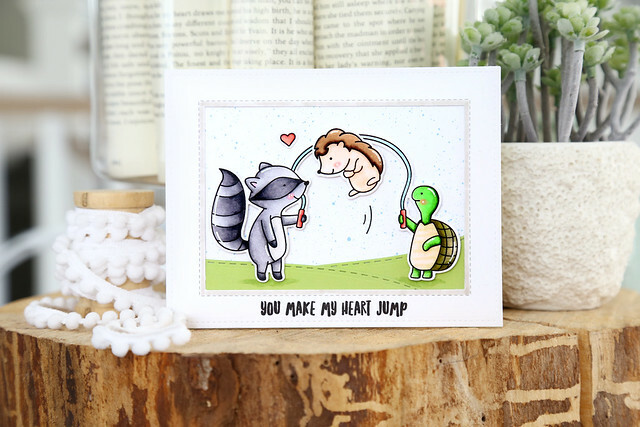 Our newest release hit the store this past Friday, and I have another card to share using my brand new set, Jump For Joy. It features images that I illustrated, and some of my favorite sentiments ever. I kept this card very clean and white, with the only pops of color coming from the critters and the grassy hills (made using the Stitched Slopes dies). I positioned the jumping hedgehog so that he is having a sweet moment with the raccoon. I just think they are too cute like this! I created a chunky outer frame for my card (using Lawn Fawn rectangle dies) and stamped the sentiment at the bottom, just like a picture frame. 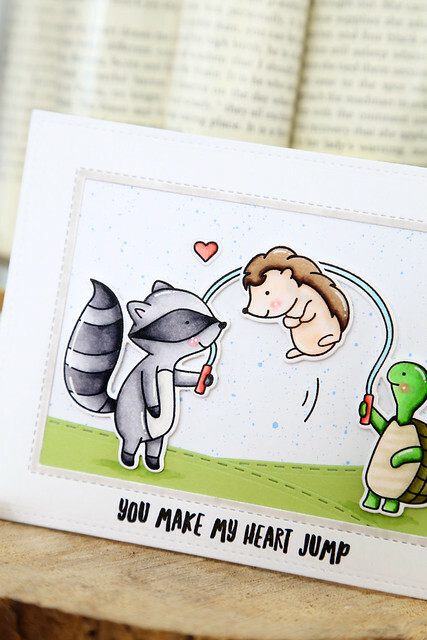 The tiny little heart place between the raccoon and hedgie reinforce the sentiment perfectly.